High-quality, Return Program imaging unit is essential to Lexmark Print System Performance in Lexmark printers including the following series, MX710, MX810, MX811, MX812, MS710, MS711, MS810, MS811 and MS812. 520Z imaging unit is designed to work best with Unison toner to perform in an innovative, shake-free print system. Genuine Lexmark supplies are engineered to work Best Together with your Lexmark printer, delivering excellent print quality from the first page to the last. 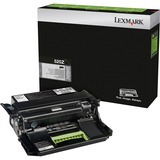 Lexmark Return Program Imaging Units are patented devices that are sold at a special price subject to the restriction that the imaging unit may be used only once. Following the initial use, the customer agrees to return the imaging unit only to Lexmark for remanufacture and/or recycling.